There are a lot of things we look forward to when we prepare for a life of retirement and those “golden years” of being a senior citizen. It takes a bit of getting used to transition to becoming granddad or grandma and no longer having all those stresses of job and family. This is not to say that we don’t have our share of concerns as senior citizens. Along with the transition to a slower life, however, we also get a new set of things to worry about in our senior years. Your physical condition is something on your mind as your body ages. Finances can be a concern and, as always, you worry about your kids and grandkids. But one worry that sits at the back of the minds of many senior citizens is the worry that some day your kids will want to put you in a nursing home. The aversion to the very idea of going to a nursing home goes back decades, probably to the days when a nursing home was really the only alternative when a senior needed medical care daily. It wasn’t that long ago that the phrase, “being placed in a nursing home” was equivalent of being put out to pasture to wait for death. Moreover, the real nightmare has always been that your own dear children would somehow become tired of caring for you and “stick you in the nursing home” just to get old grandma and grandpa out of the way. So we have the concept of a terrible living condition, loss of freedom, home and friends and rejection of family that builds up into a pretty horrible fear as you move into your golden years. The occasional story about nursing home abuse that seems to get lots of space in the newspaper doesn’t help our worries one little bit. Well, first off, no one uses the term Nursing Home anymore. The term has earned such a bad rap over the past 20 years that not only the phrase, but the institution itself is quickly being replaced with a more wholesome and progressive concept called Assisted Living and Skilled Care facilities. So, too, is gone the concept that dormitory lockdown is the predominant facility when talking about Assisted Living and Skilled Care facilities. Just not true any more. These ideas of economy of scale en mass impersonal lockdown institutions are, thanks to baby boomers, undergoing a significant shift to commercial private residence structures that cater to 5-10 seniors at a time. The fear of being an inmate among hundreds of other inmates is no longer based in reality. There are a lot more options available to senior citizens for finding a place to live after you leave your home where you can get some care but not have to fear the nightmare scenario of a nursing home. In the last twenty years, the field of elder care has undergone what can only be described as a revolution. Now, instead of nursing homes as your only option, there are assisted care facilities, managed care and senior apartment communities where you can continue to live a life of freedom, creativity and independence but still have as much care as you need and only when you need it. 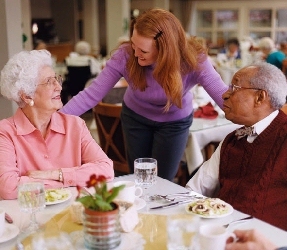 An assisted care facility can work almost exactly like an apartment complex or condominium. Depending on what kind of care you need, the directors of assisted care facilities can custom design how much care you need. They can take a lot of the daily chores off of your mind so you can really enjoy your golden years. Typically an assisted care facility will do your laundry, provide for food and help with special diets if your doctor prescribes and provide the security both for your safety and that you have people around to look in on you should a problem come up. This can be a tremendous relief to family and to you that you never have to worry about falling and not having help. The staff at your assisted care home are there to help you and support you as much as you need when you need it but when you don’t need them around, they disappear into the woodwork so you can live a happy independent life until you need them again. There are medical people on call should you need them and the great thing about these facilities is that if you need more care over the years, they can gradually add those services on an as needed basis and you never have to move out or change your lifestyle. This means that there is not going to be a reason to have to move again in order to 'chase' care capability around from facility to facility. Most of these residences will be happy to provide you the expanding care that you need, when you need it. This truly is the best of both worlds because you can live as independently as you can but have help there on call when you need them to be there. Above all, these are places that you can easily call 'my home'. It’s a place of friendship and social interaction. It certainty is NOT a nursing home.